At last the apple pruning is finished and we can get on with the next urgent task: adding goodness to our soil. In this part of the South Downs it is free draining alkaline soil with lots of chalk, interspersed with lumps of flint of varying sizes and occasional seams of claggy clay not far below the surface. It doesn’t half need feeding regularly otherwise the plants begin to take on a rather sorrowful look. When we first came here in 2011 I rang around a few places - local farmers, livery stables, horticultural societies - to see if I could locate a source of good manure but met with no useful success. 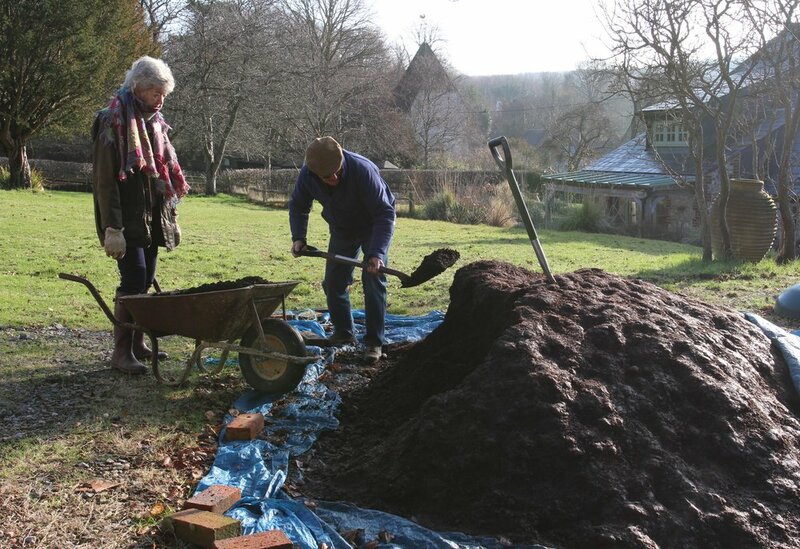 “We’ve got fresh stuff, and you can come and collect if you like” was the nearest I got, but as I was after mature manure delivered to our door it became obvious I was asking for the moon. Come tomorrow, She Who Must Be Obeyed and I will continue to load wheelbarrow after wheelbarrow until our large pile of Puckamuck has finally disappeared. Then we’ll feel really virtuous. Oh, and healthy.